I LOVE pasta, I will happily confess this and, regularly, bang on about it quite a bit. However, I am also aware that the amount of pasta I would happily stuff my face with is not necessarily that good for me and leaves me feeling heavy, stuffed and bloated. I have by no means given up pasta, but I have found a way of indulging in some of my favourite dishes without the guilt and without the enormous belly afterwards. Using vegetables and spiralisers is not a new phenomenon. Plenty of other food bloggers and TV chefs have been preaching about it for ages, I’m just a little late to the party. A little while ago I did blog about my first experience of courgetti spaghetti with this simple olive and garlic dish. I have since upgraded to a bit of a fancier spiraliser and am now able to create a variety of shapes with different vegetables that wouldn’t fit in the old narrower spiraliser. Similarly to my last spiralising adventure I’ve also used courgette to create my ‘noodles’ in this dish. 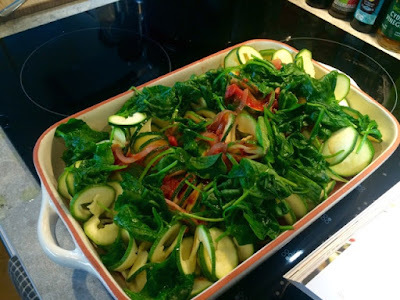 I will branch out, I promise, but courgettes just work so well and they also happen to be one of my favourite vegetables. Going totally veggie with this dish, I chose to base it on one of my all time favourite baked pasta dishes, spinach and ricotta cannelloni. 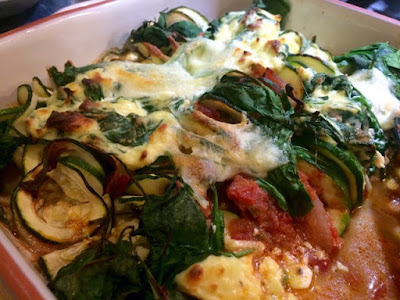 Obviously I did not attempt to form tubes out of the spiralised courgettes, so this was a bit of deconstructed version with pockets of the cheesy spinach filling dotted across the dish as opposed to it being stuffed into pasta shapes. What I love about this dish (aside from the spiralising element) is that you get the best of both worlds when it comes to pasta sauces. Usually you have to choose between going tomato based or creamy/cheesy with your sauces. With this dish, you can have both! The pockets of cheesy goodness sit nestled amongst the tasty, juicy tomato sauce like a little indulgent treat. This is a great dinner for four and is plenty on it’s own but could be served bit salad on the side. It also takes great re-heated the next day for lunch. Therefore I am entering this into Searching for Spice’s Cook Once Eat Twice blog link up. 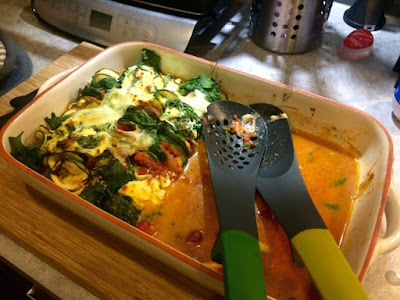 Pop over to Corina’s blog to check out other great dishes you can cook once and serve up again for lunch or dinner the next day. 2. Using a spiraliser, vegetable peeler or whatever your chosen tool, turn your courgette into ribbons. 3. 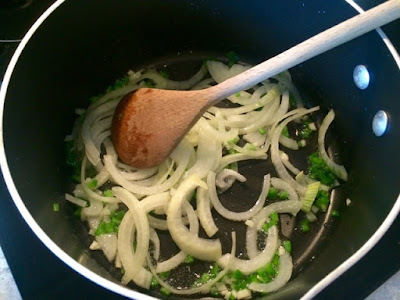 In a saucepan on a medium heat, gently fry the onion, chilli and garlic in olive oil. 4. When vegetables are softened add the tomatoes and bring to the boil. Add the basil leaves and simmer for 5-10 minutes. 5. 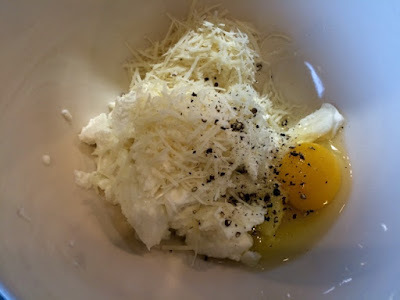 Meanwhile in a bowl mix together the ricotta, half the mozzarella, parmesan, egg and salt and pepper. 6. 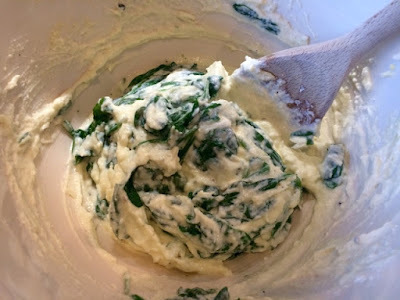 Wilt the spinach, drain, and mix half the spinach into the cheese mixture. 7. 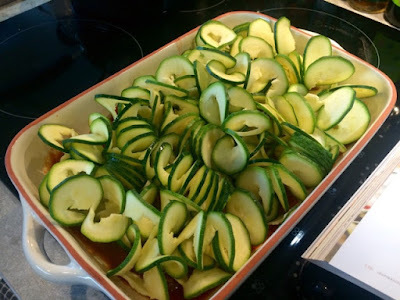 In a large ovenproof dish, pour in half the tomato sauce and lay over the courgette ribbons. 8. 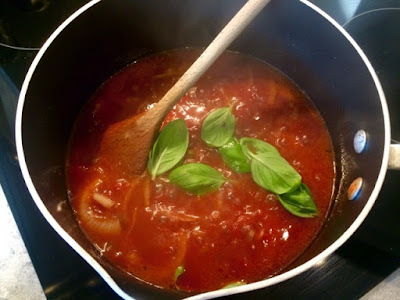 Pour over the rest of the tomato sauce and scatter over the remaining half of the spinach. 9. Create pockets in which to put large spoonfuls of the cheese mixture evenly across the dish. Scatter over the remaining mozzarella. 10. Bake in the oven for 25 minutes until golden and bubbly on top. This looks absolutely delicious – a real comfort meal but what I also love is how fresh and healthy it looks! 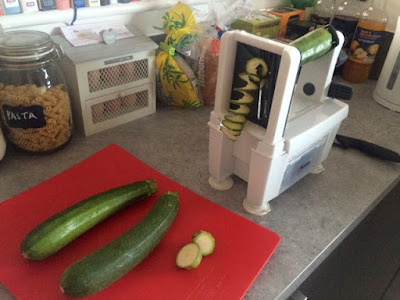 I would love to get a spiralizer and have actually been looking at some earlier today. This is a great way of using it and nice to see the vegetables being cut slightly differently – a nice change from courgetti! 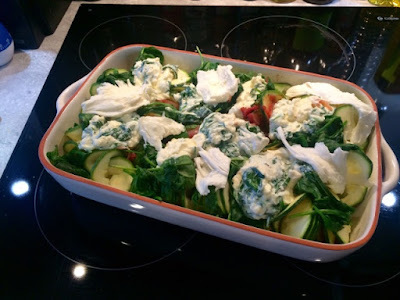 Thank you so much for linking up to Cook Once Eat Twice.